Photo courtesy of Bobbi Wilsyn. Wilsyn is recognized for her contributions to and accomplishments in Jazz music spanning decades. CHICAGO—Nov. 6, 2018. 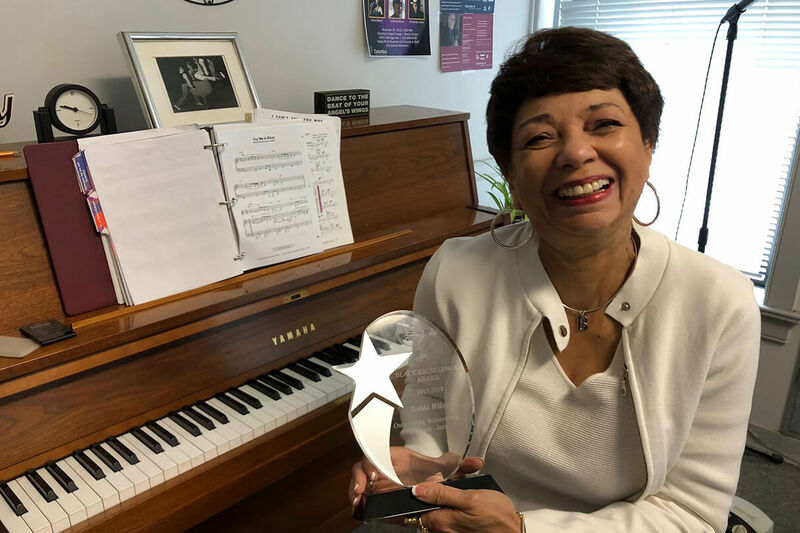 Bobbi Wilsyn, long-time Columbia College Chicago faculty member and coordinator of the Vocal Studies program, received the Black Excellence Award 2018 from the African American Arts Alliance of Chicago (AAAA) for Outstanding Achievement in Jazz Music. Wilsyn was honored at the AAAA’s annual awards event held at the Black Ensemble Theater Cultural Center on Oct. 29. Wilsyn is an international performing artist who has been an integral member of Columbia for nearly four decades, serving in different capacities including as adjunct instructor, senior lecturer, professor of instruction, and coordinator of the Voice and Choral Ensemble. She teaches a range of techniques in contemporary singing and vocal improvisation, as well as Pop, R&B, Jazz, Blues, and Gospel. Interim Dean of the School of Fine and Performing Arts Rosita M. Sands credits Wilsyn for her significant  contributions to the Music Department’s curriculum and distinctive focus on the performance of contemporary, urban, and popular music. Wilsyn has performed at prestigious venues across the globe and in the Chicagoland area, including the Symphony Center, Ravinia, Harris Theatre, Auditorium Theatre, and Millennium Park. She has performed with Jazz greats such as Ramsey Lewis, Corky Siegel, Joe Levano, Art Hoyle, Ari Brown, and the late Jazz legends  Eldee Young, Von Freeman, James Moody, Buddy DeFranco, Johnny Griffin, Billy Taylor, and Johnny Frigo. Wilsyn founded the all-female Jazz combo, SHE, featuring some top women Jazz instrumentalists and performs with Chicago's Eleven Jazz Divas. As a masterclass facilitator, Wilsyn has presented workshops for the Jazz Institute's Straight-Ahead Jazz Camp and internationally in Santa Arissi, Sardenia, Conservatorio di Bari, and the Conservatorio di Pescara. She was featured with the Chicago Jazz Ensemble and has presented with Orbert Davis’ Chicago Jazz Philharmonic for the performances of “Through Ella's Eyes.” Wilsyn’s album It’s About Time features some of her own compositions and her one-woman shows are tributes to famous ladies of jazz as well as musical theater cabaret. More about Bobbi Wilsyn is available here. The Black Excellence Awards are given to outstanding artists in the fields of film, dance, music, literature, visual arts, and theater. Each year, the Black Excellence Committee is responsible for viewing artists in a particular field for 10 months after which the most outstanding individual in each field is given the award. Columbia College Chicago is a private, nonprofit college offering a distinctive curriculum that blends creative and media arts, liberal arts, and business for nearly 7,000 students in more than 100 undergraduate and graduate degree programs. Dedicated to academic excellence and long-term career success, Columbia College Chicago creates a dynamic, challenging, and collaborative space for students who experience the world through a creative lens. For more information, visit colum.edu.